Instead of setting New Years resolutions this year, I want to help people form healthy habits. It got the opportunity to go on Global Winnipeg this week to talk about one of my biggest passions, and that is forming healthy habits! Resolutions and setting goals rely on motivation, inspiration, will power, and self-discipline. This can be hard to find when getting started. This is usually what holds people back from achieving their goals. Forming good habits is fairly easy to do, and once it becomes part of your life, you won’t notice it, or find it difficult. You have to start small, and break it down. Have a listen to my interview! 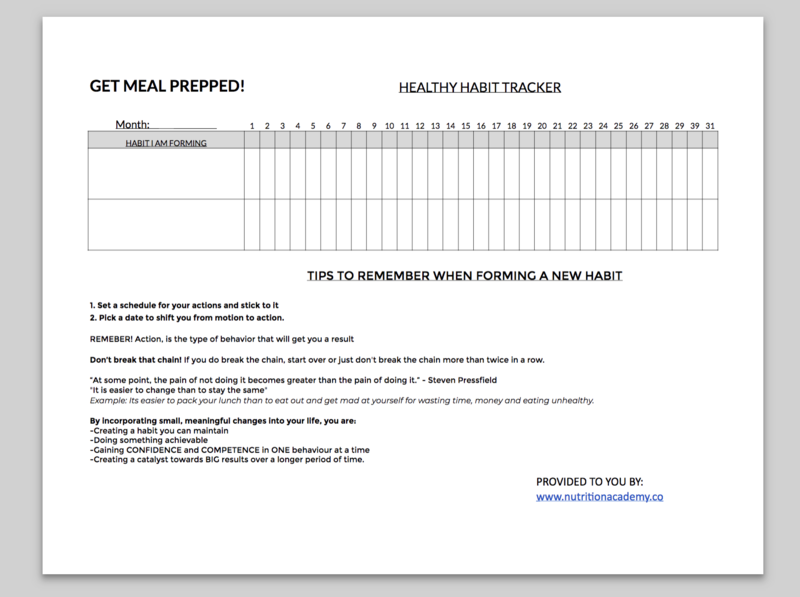 GET our free HABIT TRACKING TOOL below! As mentioned, you have to start small, and break it down. For example, someone might want to break the bad habit of eating out for lunch at work during the week. That can be pretty hard if they have gotten used to doing this over the years. The best way to break this bad habit is to form a new habit, like cooking up extra supper and packing it up for lunch the next day. You can pair this habit with your kitchen clean up and lunch is done. No more hurrying around in the morning and deciding to just pick up lunch during the day. When you track your success it becomes more motivating. For everyday you do your task, put an X on your calendar. Eventually you will form a chain. Then, the key is to not break the chain …but if you do, just don’t break the chain twice. Stay hydrated by carrying a water bottle with you throughout the day.